High production speed and faster make ready are the hallmarks of the new INNOFORMER™ Cover Production System for producing covers, inserts, flyers and pinless four and eight pagers. 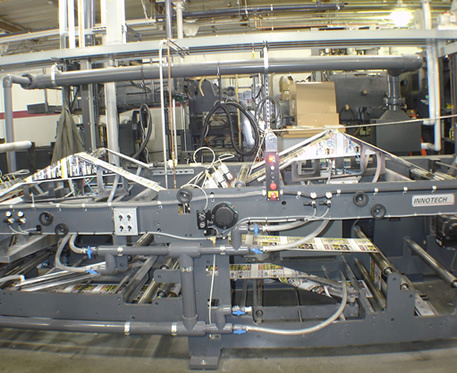 Innotech’s INNOFORMER™ Cover Production System, is designed for production of folded and flat covers for saddle stitched and perfect bound magazines and catalogs. Unlike competitive systems that depend on conventional plows to make folds, Innotech system uses the revolutionary INNOFORMER™ folding technology to make folds. The gentle folding action of air bars and precise geometry enable running a full range of stock, including heavy cover stock, without gusseting or cracking. The INNOFORMER™ does not require various adjustments needed by plow folders and thus saves valuable make ready time on today’s high speed presses. INNOFORMER™ Cover System can be located inline with the press or at right angle or parallel configuration. The system can be press driven or independently driven to follow the press. Two INNOFORMER™ stations, arranged in series each with two INNOFORMER™ assemblies and a slitter section and web shifter angle bars to re-align two ribbons from one web for 8 pagers. Rotary Cutter to cut folded or flat covers and produce shingled delivery stream or streams. Two around cutting with or without cross trimming capabilities. Copyright © 2012 Innotech Graphic Equipment Site by Ewebkut.